A multiplate clutch has three pairs of contact surfaces. The outer and inner radii of the contact surfaces are 100 mm and 50 mm respectively. The maximum axial spring force is limited to 1.25 kN. If the co-efficient of friction is 0.35 and assuming uniform wear, find the power transmitted by the clutch at 1600 rpm. 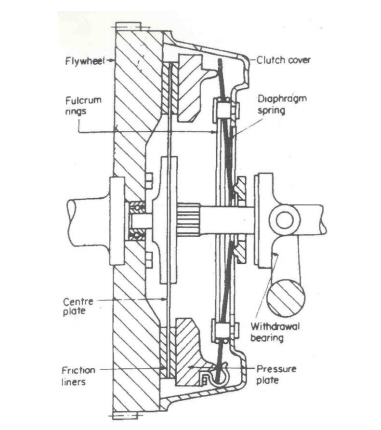 Explain the working of centrifugal clutch with neat sketch. • A centrifugal clutch is a clutch that uses centrifugal force to connect two concentric shafts, with the driving shaft nested inside the driven shaft. • It consists of number of shoe on the inside of a rim of pulley. The outer surface of pulley is covered with friction material. • These shoes move radially in guides. • As the speed of the shaft increase, the centrifugal force on the shoes increases. • When the centrifugal force is less than the spring force, the shoes remain in the same position as when the driving shaft was stationary, but when the centrifugal force is equal to the spring force, the shoes are just floating. • When the centrifugal force exceeds the spring force, the shoes move outward and come into contact with the driven member presses against it. • The force with which the shoe presses against the driven member is the difference of the centrifugal force and the spring force. • The increase of speed causes the shoe to press harder and enable more torque to be transmitted. 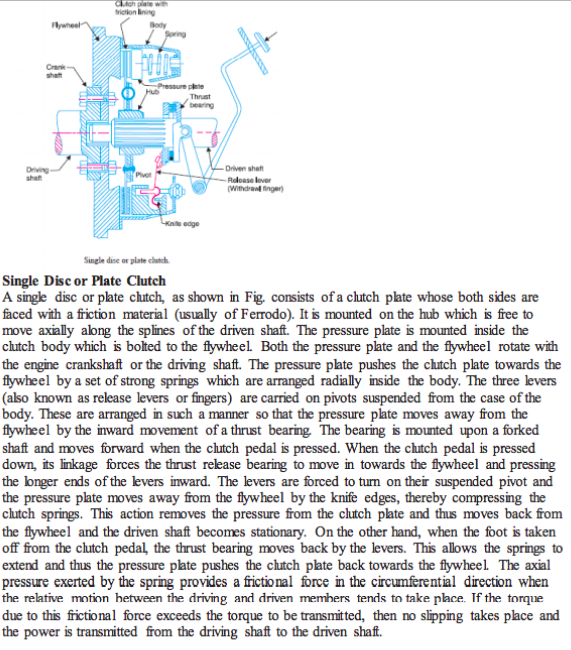 Explain the working of single plate clutch with neat diagram. 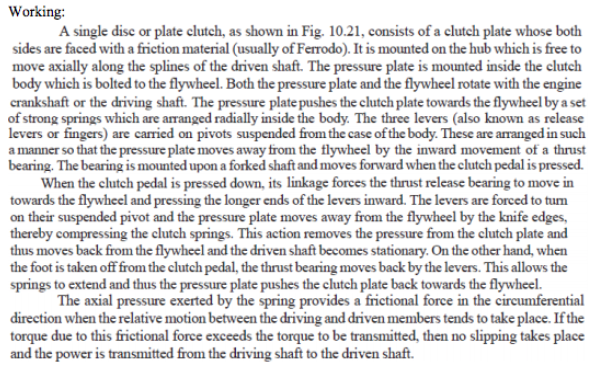 State function of clutch. Explain working principle of clutch. Draw the neat sketch of diaphragm clutch and explain its working. Diaphragm Spring Type Single Plate Clutch A diaphragm spring type clutch is shown in fig. 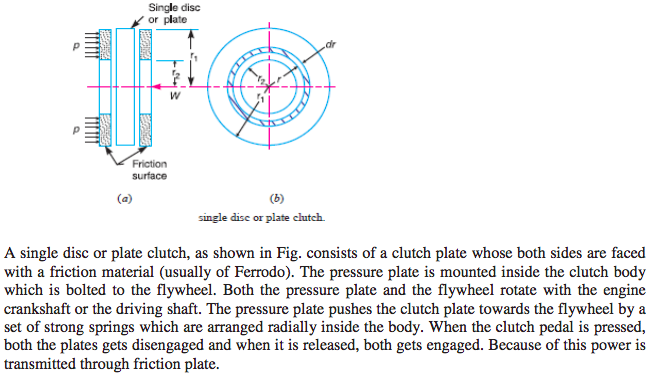 where shows the clutch in the engaged position and in the disengaged position. It is seen from the above figures that the diaphragm spring is supported on a fulcrum retaining ring so that any section through the spring can be regarded as a simple lever. The pressure plate E is movable axially, but it is fixed radically with respect to the cover. This is done by providing a series of equally spaced lugs cast upon the back surface of the pressure plate. The drive from the engine flywheel is transmitted through the cover, pressure plate and the friction plate to the gear box input shaft. The clutch is disengaged by pressing the clutch pedal which actuates the release fingers by means of a release ring. This pivots the spring about its fulcrum, relieving the spring load on the outside diameter, thereby disconnecting the drive. A flat foot step bearing 225 mm in diameter supports a load of 7500 N. If the co-efficient of friction is 0.09 and the shaft rotates at 600 rpm, calculate the power lost in friction. A single plate clutch, effective on both sides, is required to transmit 25 kW at 3000 rpm. 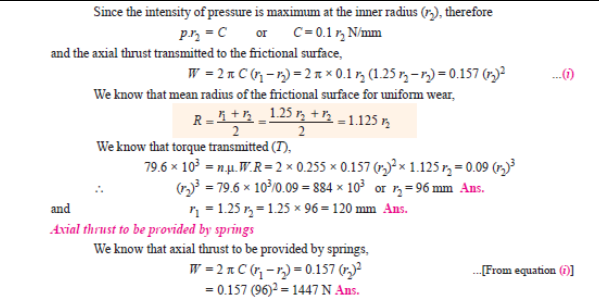 Determine the outer and inner radii of frictional surface, if the co-efficient of friction is 0.255 the ratio of radii is 1.25 and the maximum pressure is not to exceed 0.1 N/mm 2 . Also determine the axial thrust to be provided by springs. Assume the theory of uniform wear. Explain: (i) Uniform pressure theory. 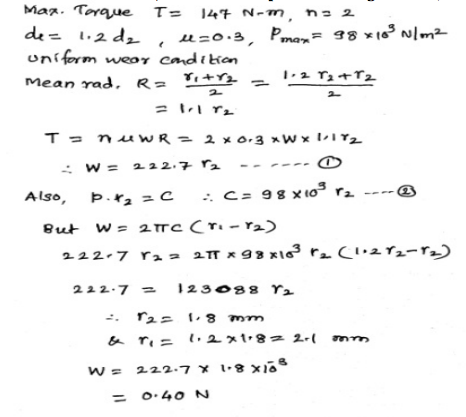 (ii) Uniform wear theory in clutches and bearing. surfaces may be good over the whole surface. It means that the pressure over the rubbing surfaces is uniform distributed. The condition assumes that intensity of pressure is same. parts of the rubbing surfaces will not move with the same velocity. upon the intensity of pressure (P) and the velocity of rubbing surfaces (V). pressure and velocity of rubbing surfaces. P*r = Constant; where, P = intensity of pressure, r = radius of rotation. Draw a labelled sketch of multiplate clutch and state its applications. A multiplate disc clutch transmits 55 kW of power at 1800 rpm. Coefficient of friction for the friction surfaces is 0.1. Axial intensity of pressure is not to exceed 160 kN/m2 . The internal radius is 80 mm and is 0.7 times the external radius. Find the number of plates needed to transmit the required torque. Explain working principle of clutch. State its location in transmission system of an automobile. A friction clutch has its principal application in the transmission of power of shafts and machines, which must be started and stopped frequently. The force of friction is used to start the driven shaft from rest and gradually brings it up to the proper speed without excessive slipping of the friction surfaces. 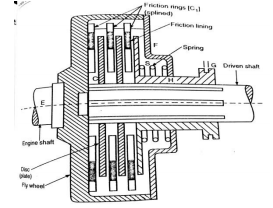 In automobiles, friction clutch is used to connect the engine to the driven shaft. In operating such a clutch, care should be taken so that the friction surfaces engage easily and gradually brings the driven shaft up to proper speed. Location: Between the engine and gear box. Draw a neat labelled sketch of “Multiplate Clutch”. An engine of a car has a single plate clutch developed maximum torque 147 N-m. External diameter of clutch plate is 1.2 times its internal diameter. Determine the dimension of clutch plate and axial force provided by the spring. The maximum pressure intensity of the clutch facing 98 kN/m2 and coefficient of friction is 0.3. Assume uniform wear condition. What is the necessity of clutch? State its types. Necessity: A clutch is necessary for the transmission of power of shafts and machines which must be started and stopped frequently. Its application is also found in cases in which power is to be delivered to machines partially or fully loaded. The force of friction is used to start the driven shaft from rest and gradually brings it up to the proper speed without excessive slipping of the friction surfaces. 1. The contact surfaces should develop a frictional force that may pick up and hold the load with reasonably low pressure between the contact surfaces. 2. The heat of friction should be rapidly dissipated and tendency to grab should be at a minimum. 3. The surfaces should be backed by a material stiff enough to ensure a reasonably uniform distribution of pressure. 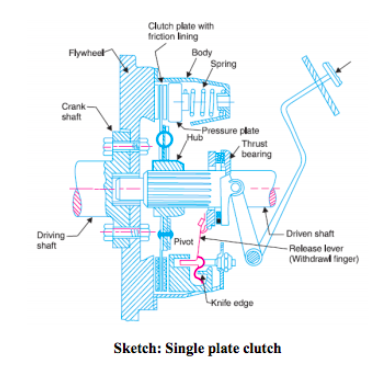 Draw the neat sketch of single plate clutch and explain its working. A single plate clutch with both sides effective has outer and inner diameters 300 mm and 200 mm respectively. The maximum intensity of pressure at any point in the contact surface is not to exceed 0.1 N/mm2. If the coefficient of friction is 0.3, determine the power transmitted by a clutch at a speed of 2500 rpm. Assume uniform condition.